← Where Are the Muslim Doctors and Nurses? Finding a reliable and engaging one-volume introduction to the history of philosophy from an orthodox Christian perspective is rather like finding an empty taxi on Hogmanay, but Craig Bartholomew and Michael Goheen have significantly eased the task with this new offering. 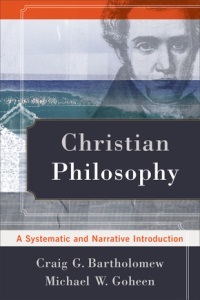 In the opening chapters the authors set out their vision for Christian philosophy. Foundational to this vision is the doctrine of creation; thus philosophy is “the attempt to discern the structure or order of creation, and to describe systematically what is subject to that order.” From this base, the authors discuss the importance of philosophy for various elements of the Christian mission: apologetics, practical ethics, cultural engagement, and Christian scholarship. They reflect on the relationship between faith and philosophy, focusing on the concept of a worldview, grounded in the biblical metanarrative, which plays “a vital mediating role between Scripture and philosophy.” A worldview is unavoidable, and while a worldview is not equivalent to a philosophy, it can be “developed into” a philosophy. The second and central part of the book tells “the story of Western philosophy” through the lens of a biblical worldview (more precisely, as the authors admit up front, an Augustinian-Kuyperian worldview). The story unfolds over ten chapters: ancient pagan philosophy from Thales to Socrates; Plato, Aristotle, and Neoplatonism; the “medieval synthesis” from Augustine to Abelard; late scholasticism, with the inevitable (but justifiable) focus on Aquinas; Renaissance and Reformation; early modern philosophy from Bacon to Leibniz; two chapters on modern philosophy, with particular attention given to Kant, Kierkegaard, and Nietzsche; and postmodern philosophy. The final part—“Christian Philosophy Today”—represents the book’s most distinctive contribution. Here the authors survey and celebrate the recent renaissance in Christian philosophy. Some attention is given to Catholic philosophers (particularly McIntyre and Taylor) but the lion’s share is devoted to expounding two “Neocalvinist” movements: the Reformed epistemology of Plantinga and Wolterstorff, and the Reformational philosophy of Dooyeweerd. The relevance of these movements is illustrated through their application to issues in apologetics, politics, and cultural criticism. Overall the book offers a well-balanced, coherent, and critical but charitable survey of Western intellectual history from a broadly Reformed perspective. The authors’ open admission of the authority of Scripture and the need to do philosophy as Christians is refreshing. One minor criticism: some thinkers (e.g., Schleiermacher and Frege) are treated so very briefly as to raise the question whether they ought to have been included at all. This entry was posted in Philosophy, Reviews and tagged Christian philosophy, Craig Bartholomew, history of philosophy, Michael Goheen, Neocalvinism, Reformed epistemology, Reformed philosophy, worldview. Bookmark the permalink.